Rick Breitenfeld, a retired station executive whose work in the early 1960s helped shape the case for the Public Broadcasting Act, died Friday in Warminster, Pa., following pancreatic cancer. He was 87. Breitenfeld’s many career achievements include serving as founding executive director of the Maryland Center for Public Broadcasting and leading Maryland Public Television for 17 years; chairing the first board of American Program Service, now American Public Television; leading WHYY in Philadelphia for 14 years; and working as a member of the FCC’s Temporary Commission on Alternate Funding for Public Broadcasting in 1993. “The word pioneer is often overworked, but in Rick Breitenfeld’s case it’s more than apt,” MPT President Larry Unger said in a statement. In 1964, Breitenfeld, who was teaching at the time, directed a research study on educational TV for the U.S. Office of Education. He authored the report, “The Long-Range Funding of Educational Television Stations” the next year. That study sparked the first Carnegie Commission on Educational Television, which proposed federal funding for educational television and influenced passage of the Public Broadcasting Act of 1967. In 1966, the Maryland Educational–Cultural Television Commission appointed Breitenfeld as the first executive director of the Maryland center, three years before WMPB in Owings Mills went on the air. Under his leadership the state network grew became a production hub for national series including Wall $treet Week. Breitenfeld also established the station’s reputation as an educational leader by creating the distance-learning Maryland College of the Air and the National University Consortium for Telecommunications in Teaching. He joined WHYY in Philadelphia in 1983 as president and GM. During Breitenfeld’s tenure, WHYY’s television viewership doubled and its operating budget grew from $8 million to $10 million. In addition, WHYY-FM’s Fresh Air began national distribution through NPR. 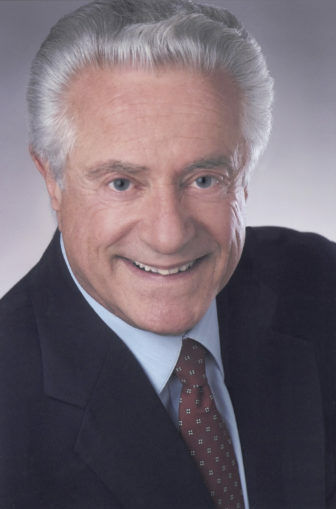 In addition to his public broadcasting work, Breitenfeld acted in government and industrial training films, as well as in the NBC series Movin’ On. He also appeared as a stand-up comic on CBS. And Breitenfeld portrayed Dr. Arnold Quackenshaw in director John Waters’ 1981 comedy cult classic Polyester. Breitenfeld was born Sept. 26, 1931 in New York City and grew up in New Rochelle, N.Y. He received his bachelor’s degree in engineering and a master’s in education from Tufts University. He also received a master’s in radio and television and a doctorate in communications from Syracuse University. He was preceded in death by his wife of 44 years, Mary Ellen, in 1998; and his companion of 18 years, Nedra Sanderson, in 2017. He is survived by two children Ann Langtry of Lower Makefield, Pa., and Kathleen Breitenfeld of New York City. Services are private, with a celebration of his life at a later date. Memorial donations may be made to the Frederick Breitenfeld Fund, c/o MPT Foundation, Inc., 11767 Owings Mills Blvd., Owings Mills, MD 21117, or to a charity of donor’s choice. Our new podcast revisits the roots of public media by bringing together founders and up-and-comers. Rick believed television could be far more than it was, and pursued that dream. He built a creative nirvana for us at the Maryland Center. RIP Dr. B.
Rick was totally unique, period! He stood out even in a field that boasted many outstanding performers. He was all the things you want in a leader, a fabulous communicator himself, a teacher among and for his colleagues, a leader among equals, a finder and developer of talent, a wonderful companion at work and among his peers, respected for both his knowledge and his wisdom. . . . . Rick was unique even among his professional associates. Most of all we loved him as much as we admired him. I worked at the law firm of Schwartz, Woods & Miller for 49 years. MPT was one of our very first clients and they still are. I met Rick when I was about 19, had just joined the firm. I told him recently that among all our hundreds of clients, he was the only one I was madly in love with. NO one made me laugh like he did. The most unforgettable man I have ever met. RIP my dear friend, I can’t wait to laugh with you again.